A new Forum Research Poll that made headlines last week showed that 70% of voters in Toronto support a $15 minimum wage. These numbers are in line with another Poll released last year showing that two-thirds of Canadians wanted to see a $15 minimum wage. So far, the Federal New Democrat Party, the Ontario New Democrat Party, the Green Party, and Quebec Solidaire have all thrown their support behind a $15 minimum wage. Will the Ontario Liberal Party get on board? Click here to share this photo on Facebook. Workers in Ontario have been loud and clear about what we need to make ends meet. In the beginning, some naysayers said $15 was unreasonable, and that we should just stop asking. Critics voiced the false idea that a higher minimum wage would harm the economy, particularly small businesses. Yet we knew that more money in low-wage workers’ pockets would bring a big boost to the economy and create more jobs in our communities. Now, business leaders themselves are speaking up on the economic benefits for paying workers a decent wage. With so many wins taking place in the fight for $15, it proves that it’s worth the effort to push for necessary change. Last spring, New York and California signed minimum wage hikes into law, promising $15 an hour to 10 million workers. A total of 19 million US workers are benefiting from raised minimum wages. With $61.5 billion dollars in raises so far, low-wage workers are now able to participate in the economy in a more dignified way. In the meantime, the evidence coming from Seattle where a $15 minimum wage is being phased in shows that a fair minimum wage not only directly helps workers and businesses, but can also lower unemployment numbers. Nobody benefits from poverty wages, so why do we allow them in Ontario? The current minimum wage of $11.40 leaves workers more than 16% below the poverty line, even when they are lucky enough to find full-time hours. 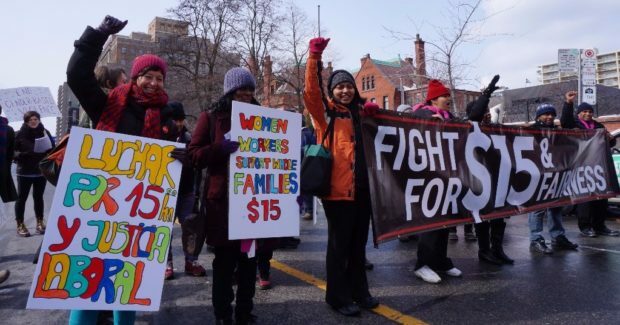 Last October, thousands of workers gathered at Queen’s Park to call for a $15 minimum wage and fair working conditions. This happened on the same day Alberta started phasing in $15, which they’ll have in place in 2018. Now it is Ontario Premiere Kathleen Wynne’s turn to do the same. A recent CBC News story suggests that many Liberal MPPs are leaning toward supporting a $15 minimum wage as part of their 2018 election platform. They haven’t made an official commitment yet, but, if the Liberals want to get elected, they will support $15 and Fairness. This is not only the right thing to do, but it is also what Ontarians want. We need to keep organizing to demonstrate this growing support to every elected official in this province! We can’t give up.